Osteo-Nutrients II with Vitamin K2-7 is easy to swallow and the price is great. 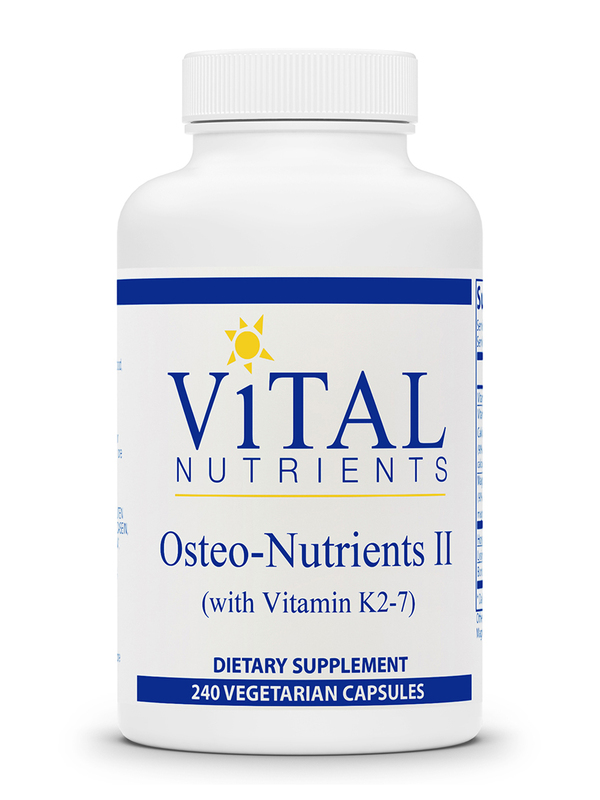 Osteo-Nutrients II with Vitamin K2-7 by Vital Nutrients is definitely needed for overall healthy living. Vital Nutrients’ Osteo-Nutrients II is an effective nutritional supplement that promotes bone support. Its powerful formula features high amounts of the essential minerals calcium and magnesium‚ along with other nutrients critical for healthy bones and teeth. Both magnesium and calcium have also been found to play vital assisting roles in other physiological operations‚ such as the maintenance and construction of bone mass and strength before and during menopause. Boron—which also plays a role in bone health—has been added to this formula as well. Regular exercise and a healthy diet containing sufficient amounts of calcium help teenage and young adult women maintain good bone health‚ and may reduce their risk of developing osteoporosis later in life. For people with a family history of osteoporosis‚ menopausal women‚ and the elderly of both genders‚ adequate calcium intake is linked to reduced risk of osteoporosis; this is due to its ability to slow the natural rate of bone loss. 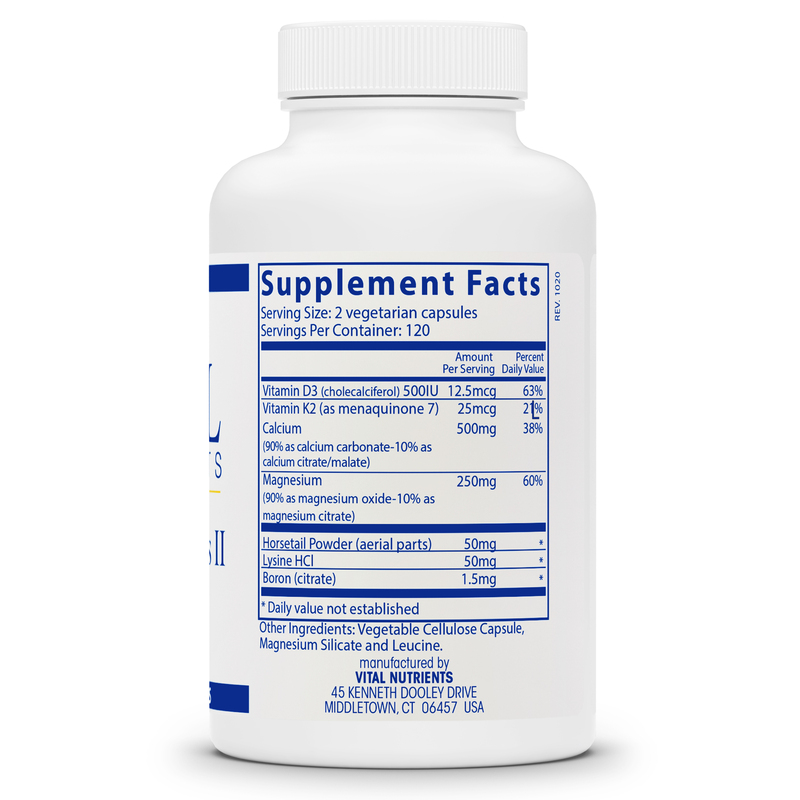 The calcium provided by this supplement works to preserve strong teeth and bones. At the same time‚ the mineral is involved in nerve signaling‚ proper heart function‚ muscle contraction‚ and relaxation. Supplementation with Osteo-Nutrients II by Vital Nutrients boosts amounts your calcium levels; this may contribute to preventing or treating specific health conditions such as high blood pressure‚ osteoporosis‚ rickets‚ premenstrual syndrome (PMS)‚ high cholesterol‚ obesity‚ and hypoparathyroidism (a condition characterized by abnormally low levels of the parathyroid hormone). Ongoing clinical studies may discover yet more benefits! Magnesium is also featured in each capsule for its ability to improve sleep quality‚ reduce muscle cramps‚ and enhance your general sense of wellbeing. In fact‚ magnesium is an integral part of over 300 of the body’s vital processes: providing support for healthy immune system and nervous system functioning‚ as well as maintaining strong bones and promoting cardiovascular health‚ are just a few of its tasks. Osteoporosis isn’t an inevitable side effect of aging. 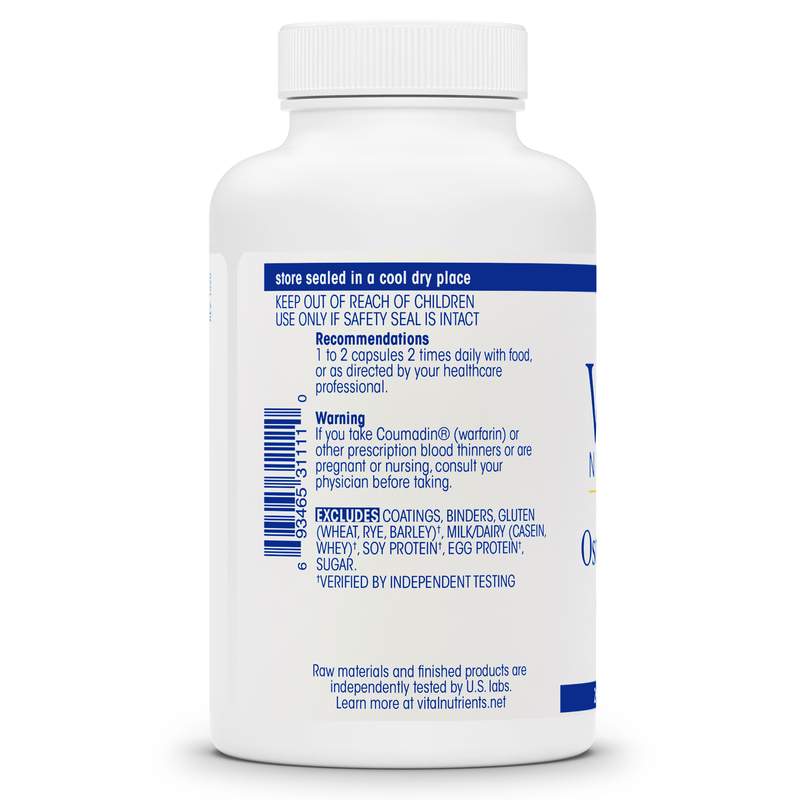 Combat bone loss by adding Osteo-Nutrients II to your daily supplement regimen. Other Ingredients: Vegetable cellulose capsule‚ magnesium silicate and leucine. 1 to 2 capsules 2 times daily with food‚ or as directed by your healthcare professional. If you take Coumadin® (warfarin) or other prescription blood thinners or are pregnant or nursing‚ consult your physician before taking. Osteo-Nutrients II with Vitamin K2-7 by Vital Nutrients has helped me with my health issues according to my lab work. It's essential for me to take. I have been taking Osteo-Nutrients II with Vitamin K2-7 by Vital Nutrients for years based on the recommendations of both my primary care practitioner and my naturopath following early bone scan tests showing osteopenia. Subsequent tests have shown no furthering of this condition, which I believe is the result of taking this supplement coupled with regular exercise. I was recommended Osteo-Nutrients II with Vitamin K2-7 by Vital Nutrients by my naturopath in order to supplement my vitamins long term. Great price for so many and all natural. Osteo-Nutrients II with Vitamin K2-7 is easy to use. The ingredients included and the purity of the product. Sometimes hard to get down but definitely worth it. I love Vital Nutrients Osteo-Nutrients II with Vitamin K2-7 becase I have to take calcium on a daily basis, and this comes with K2-7 which is hard to find. It was recommended by my naturopath to take calcium with K2-7. I like that they are capsules, and the calcium comes with K2-7. My naturopathic physician has recommended these supplements for my mother and myself who are both osteoporosis patients. 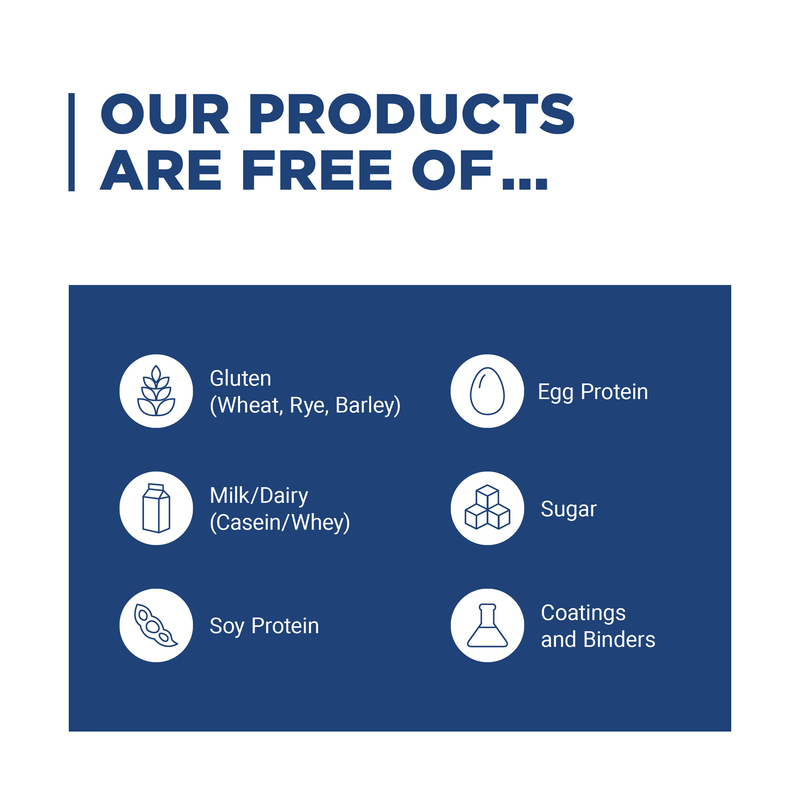 Vital Nutrients has great quality products. Price Quality Good Balance of Vitamins. Top quality as recommended by my naturopath. My gynecologist was impressed with my bone density and I have osteoporosis in my family. I have been taking this product for years. When selecting something for bone health, specifically to counteract the effects of an aromatase inhibitor to block estrogen production, what would differentiate Osteo-Nutrients from Oster-Nutrients II? Which would be the better product?? Thank you for reaching out to us! For the best answer to your questions we highly suggest contacting a certified healthcare practitioner.